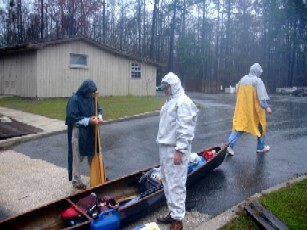 Folkston, GA--The Fellow Travelers historically have had weather problems when trips have bee n scheduled for March. The King secured a reservation from Suwannee Canal Recreation Area to Monkey Lake for March 7. On Monday the chance of rain was estimated at 10% but by Wednesday it was up to 80%. By put-in time on Friday the chances increased to 100% and the weatherman was right. Nevertheless, Art Shelfer, Greg Baker, and Charlie Stines checked into the Western Motel on Thursday night, ate a good meal at the Okefenokee Cafe, and spent the night. The rain was falling by wake-up time. The three men ate a hearty breakfast at the Family Restaurant and prepared to meet the Knave, Tim Eidson at the swamp. 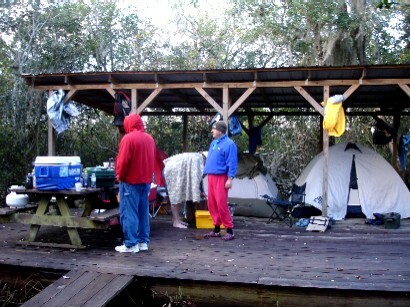 Greg forgot his tent poles so an unsuccessful effort was made to find a tent in Folkston. Greg decided to swallow his pride and share a tent with Art. Tim got a little lost finding the put-in but arrived before the boats were off the trailer. The weather report changed--for the worse. There was a tornado watch and the rain was pouring down. Still, the group loaded the three canoes and set out for Monkey Lake, a distance of seven miles through Chesser and Grand Prairies. The rains increased--probably from a severe downpour to something like a Category 2 hurricane. The winds were stiff. Greg soloed his Bell Magic, Art and Tim paired up in the Old Town Canadienne, and Charlie went it alone in the Wenonah Prism. Launch was about 9:30 AM. Paddling was hard. Heading down the canal the travelers met a group of twenty Virginia Tech students who had spent the previous night at Monkey Lake. They appeared to have had a good time and were braving the rains quite well. 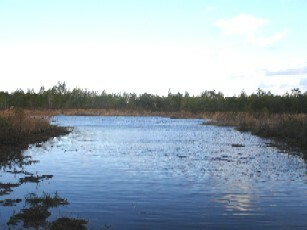 After two miles of paddling the canal the group turned left toward Chesser Prairie. The wnds increased in intensity as did the rain. It was not too long before the first of several short tops was made to bail rainwater from the canoes. The wind and rain made canoeing difficult and it was especailly so in the open waters of the prairies. The trail is not particularly well-marked but the four followed what looked liked the most used trail and it turned out to be okay. At one stop Charlie got the low battery warning on his GPS and changed the batteries. The GPS has not worked since and is probably a casualty of the trip. Conditions failed to improve but the men demonstrated great fortitude and kept paddling toward Monkey Lake. Only a few birds were seen. The wildlife probably demonstrated greater wisdom by seeking shelter. Eventually the group reached the turn-off to the shelter. It was about a half-mile farther to the shelter. Monkey Lake is not one of the usual destinations for overnight trips but is being used due to so many trails being closed due to the fire and formerly low water. The shelter is in relatively new and is in excellent shape. It is on the edge of the lake and is surro unded by hardwoods. After eating the typical snack lunches the tents were pitched. Art brought his campfire in a paint can--made from rolling cardboard and melting paraffin to saturate the cardboard. It gave off a little heat and was a pleasure to stand around. Buzzard Roost Lake and Gannet Lake are both fairly near Monkey Lake but the weather was too wet for anyone to venture on additonal sight-seeing trips. The King had planned to cook hot dogs but Art did not like the idea, so Charlie brought a rabbit. It was cooked like a beef stew along with onions, carrots, and potatoes. The cooking broth was made from one can of beer and some chili sauce. Wendy’s side salads were also eaten. It really was a feast.The major award Cook Partner four-burner campstove got its second workout. The rains continued. A raccoon visited the campsite but was run off. The swamp was dark and quiet. The occasional hoot of a barred owl was heard. After sitting around the paint can fire and the lantern drinking coffee andvtelling a few lies and hearing about Greg’s photo opportunities as a young insurance agent everyone went to bed. Sometime in the middle of the night a mouse visited Tim’s tent. Everyone thought he was yelling at a raccoon. Just after five Art got up and ran a raccoon off the platform. The trash had been hung from the rafters thinking the raccoons could not get it. Fifteen minutes later Charlie heard it again and got up. The critter had climbed onto the table and torn the trash bag. It was a mess but Charlie cleaned it up. It was too late to go back to bed so he got the campstove ready and prepared more coffee. Around seven the other three got up and ate pancakes and sausage for breakfast. T he rains had stopped but the wind had grown wilder. After emptying lots of water from the canoes and taking down the tents the four idiots began the paddle back at about 9:30 AM. There were a lot of swallow-type birds and a few other birds seen this time. The paddling was next to impossible due to the high winds. Although the sun was shining at times it was still a rough day. Eventually the weary quartet made it across the prairies and back to the canal. The wind was not nearly as tough on the canal since the trees broke a lot of the wind force. Everyone reached the take-out shortly after noon. After loading the boats and gear, Tim left the group. Art, Greg, and Charlie stopped in St. George for a good lunch at the Oak Tree Cafe. Then Art and Charlie went to Fort Shelfer (Art calls it the Place of Peace) and met Janice and Diane. Art cooked a roast in the Dutch oven before sending Diane and Charlie home.